General N. Lokhvitskiy inspecting positions accompanied by Russian and French Officers in the summer of 1916 in Champagne. Russian troops parading in front of général Henri Gouraud and général Nikolaï Lokhvitski at camp de Mailly in October 1916. In December 1915 the French politician, Paul Doumer while on a visit to Russia, proposed that 300,000 Russian troops be sent to fight in France in exchange for French munitions. While the Russian High Command showed little enthusiasm for this proposal, Tsar Nicholas II supported it. General Alexeyev, the Russian chief of staff from August 1915, made an offer to send Russian troops to France, as long as they remained under Russian officers (while operating under the French High Command). Another requirement was that the French Navy transport them. The 1st Russian Special Brigade formed in January, 1916 under the command of General Nikolai Aleksandrovich Lokhvitsky. It did not consist of regiments already in existence but was made up mostly of drafts from various reserve units incorporated into the newly formed 1st and 2nd Regiments, from Moscow and Samara respectively. The 1st Regiment's troops were mainly conscripted factory workers while the 2nd's were generally drawn from rural areas. The 1st Special Brigade totaled 8,942 men. It left Moscow on February 3, 1916 and arrived in Marseille on April 16 of the same year. The regiments were divided into three battalions of four companies each. Each regiment also had a liaison and a service section. The reserve battalion had six companies. The First Brigade was commanded by General Lokhvitsky, and was composed of 180 officers and 8762 enlisted men. Each brigade had a double supply of clothing and a kitchen on wheels. The French Navy and Army undertook to provide shipping, supplies, and equipment. The 3rd, 4th and 5th Brigades soon followed. The 2nd and 4th Brigades arrived on the Salonika front in August and November 1916. The 3rd Brigade comprised serving soldiers plus reserve units formed in Yekaterinburg and Chelyabinsk under the command of Fyodor Fyodorovich Palitzin; it left for France in August 1916. General Aleksei Brusilov, commander of the Russian Southwest Front from March 1916 was responsible for the four Special Brigades, which contributed a total of 44,319 men to the Entente effort in western and southern Europe. The 6th, 7th and 8th Brigades were never formed due to the outbreak of the Russian Revolution. Approximately 450 Estonian troops also served with the REF, mostly in the 1st and 3rd Brigades. After February 1917 these troops wore small Estonian flags to distinguish themselves from their Russian allies. In January 1916, the 1st Special Infantry Brigade (French: 1re Brigade Spéciale d’Infanterie) was formed and included two regiments (each of 3 battalions in strength), under the command of Major-General Nikolai Aleksandrovich Lokhvitsky (French: Nikolaï Lokhvitski). Transported by rail 8,942 men reached Dalian, on the Korea Bay of the Peninsula and embarked on French naval vessels (including the French cruisers Latouche-Tréville and Himalaya). The 1st Brigade reached Marseille on April 16, 1916. On July 1916, the 2nd Special Infantry Brigade (French: 2e Brigade Spéciale d’Infanterie), commanded by général Mikhail Dieterichs (French: Mikhail Dieterichs), was sent via France to the front de Thessalonique. The 3rd Special Infantry Brigade (French: 3e Brigade Spéciale d’Infanterie) was formed on June 1916, and was sent to France in August via Arkhangelsk. This brigade was commanded by général Vladimir Marouchevski (French: Vladimir Marouchevski). The 4th Special Infantry Brigade (French: 4e Brigade Spéciale d’Infanterie) commanded by général-major Maxime Leontiev (French: Maxime Leontiev) was sent to form part of the Expédition de Salonique, stopping first at Brest aboard La Lorraine (paquebot) and finally arrived at Thessaloniki on October 1916. Readying and equipping was done with the French in Camp de Mailly of France. However, the Russian brigades found themselves also engaged in combat in the Balkan regions; where British, French, Italian, Albanian, Greek, Portuguese and Serbian forces were already serving together as allies against the Central Powers. In France: the Russian brigade prepared in camp de Mailly, in Champagne, and was sent between Suippes and Aubérive on the Western Front. Russian units held the front of Champagne while French units were battling at Verdun. Russians occupied the Fort de la Pompelle near Reims. Following heavy losses during the offensive of April 1917 (bataille du Chemin des Dames) for the taking of Courcy and the Fort of Brimot, the 1st and 3rd Russian Brigades which had been placed under the French 7th Army Corps of general de Bazelaire, were both cited at the orders of armed forces, and paused at camp de La Courtine. Accordingly, both Russian special infantry brigades became the Russian Special Division commanded by Lokhvitski. In Macedonia: Russian troops participated to the reapprehending of the Serbian territory during the two battles, the Battle of Monastir (1916) and the Battle of Monastir of 1917 respectively. On 11 March the 1st Russian Brigade relieved the 152nd French brigade in the Courcy sector, just to the north of Reims They were part of Mazel's Fifth Army and took their place in the frontline, where they suffered casualties in the run up to the Nivelle Offensive. On 15 April, on the eve of the Second Battle of the Aisne, the Russian soldiers received news of the February Revolution in Russia. They formed a soviet and debated whether to participate in the battle the next day, agreeing to do so by a small majority. Thus the next day, 16 April 1917, the 1st Brigade took part in the battle and took Courcy, just to the north of Rheims. The 3rd Bridgade was also involved in the Second Battle of the Aisne and took Mount Spin. The casualties for the two brigades amounted to 4,542 men killed, wounded or missing in action. On 23 April the 1st Special Infantry Brigade transferred to the Châlons-sur-Marne area, overseen by général Henri Gouraud of the French Fourth Army. French President Raymond Poincaré, impressed by the state of the Russian camp, awarded General Lokhvitsky the Commander of the Legion of Honor. The 1st Brigade was then re-deployed further east up the Marne valley between Suippes and Auberive at the end of June 1916. News of the February Revolution started to become available to the soldiers in April 1917. At first the news was kept secret by the officers but by 12 April the news became official. Four days later the 2nd brigade lost over 4,000 casualties killed and wounded. Following the example of their comrades at home, soldiers of the Expeditionary Force based in the camp of La Courtine rejected their officers and elected soldier committees. At one meeting the committee representatives made an appeal to their fellow soldiers to refuse to drill, since they would not continue fighting. The rebellious units, considered a dangerous revolutionary influence, were ordered to Salonika. They refused, demanding to be sent to Russia. With this the military representatives of the Provisional Government on 25 June ordered loyal soldiers to vacate the camp of Courtine, leaving only those soldiers who said they would submit 'conditionally' to the Provisional Government, if allowed to return to Russia. Within 24 hours the French and Russian commanders isolated the rebel camp, cutting off pay and rations, lining the surrounding roads with troops and guns. On September 1, 1917, the remaining revolutionary soldiers, numbering around 2,000 were ordered to lay down their arms by 10:00 September 3 or be destroyed. The rebels refused and on 3 September, light and increasing artillery fire reduced their numbers. The majority of the soldiers surrendered and were arrested. By September 5, those remaining in the camp came under artillery fire, the Russian rebels opened fire on the French in response. By 09:00 on September 6 the Russian camp was completely occupied by French forces and the mutineers were disarmed. The Russians were at first sent to prison camps in North Africa and France. After some months many were sent back to Russia, while others integrated into French society. In January 2014 the Association pour la mémoire de la mutinerie des soldats russes à La Courtine en 1917 (Association for the memory of the mutiny of Russian Soldiers at La Courtine 1917) was established. A loyal remnant of Russian troops, under Colonel Gothoua, demanded that they be allowed to continue to fight. They were incorporated into either the French Foreign Legion; units of the Polish Army in France which was already serving on the Western Front; or the Russian Volunteer Legion (French: Légion Russe des volontaires), also designated as the Russian Legion of Honour (French: Légion d’Honneur Russe). The Russian Legion was attached to the French 1st Moroccan Division of division Général Daugan on December 13 1917. It continued to see active service (notably during the Second Battle of the Marne (French: seconde bataille de la Marne)) until the end of the war, before being disbanded at the end of 1918. The Russian and French units fought around Amiens in March 1918 and along the road from Soissons to Paris in May 1918. Losses during this fighting amounted to nearly 85% of the Russian Legion's numbers. In July and August additional Russian volunteers, mainly veterans of the former Expeditionary Force, enabled the Russian Legion to become first a brigade and then a regiment with a total of 2​1⁄2 infantry companies as well as a mortar unit. The unit was assigned to the vicinity of Laffaux. On September 12 the regiment penetrated three lines of fortifications despite heavy losses and were awarded a special flag by the Commander of the French Army, Marshal Ferdinand Foch as well as attracting more volunteers. By November 1, 1918 the regiment had 564 men comprising a machine gun company and three infantry companies. After the German withdrawal to the border the Moroccan Division, including the Russian Regiment, advanced towards Moyeuvre. This operation was halted by the signing of the Armistice on November 11. Near the end of 1918 the entire Russian Regiment was demobilized. Some Russians chose to remain in France, while others returned to revolutionary Russia. Among the latter was Rodion Malinovsky, the future Soviet Minister of Defence. Chef de bataillon Durand. From September 4, 1918 to December 25, 1918. 2 citations at the orders of the armed forces. The Russian Legion Battalion bears the Fourragere with ruban colors of the Croix de guerre 1914-1918 bestowed December 19, 1918. Monument to the Russian Expeditionary Force in Paris. on June 12 2011 a monument at Courcy commemorating all the sacrifices of the Russian brigades on the Western front. on May 12 2016 at Marseille, the Consulate of the Russian Federation in France dedicated a plaque commemorating the 100th anniversary of the arrival of the 1st Special Brigade of the Russian Expeditionary Corps formed in Moscow and Samara. There are also two Imperial Russian war graves in the Gouzeaucourt New British Cemetery, near Cambrai. Nikolai Aleksandrovich Lokhvitsky (1867–1933), Lieutenant-General commandant of the Russian Expeditionary Force in France, immigrated to France and rests at Cimetière Russe de Sainte-Geneviève-des-Bois. Rodion Malinovsky (1898–1967), Marshal of the Soviet Union, Soviet Minister of Defence and wounded on numerous occasions. He joined the Moroccan Division at the corps of the Russian Legion Battalion and took part in the most important combats of 1918. He would also partake notably to the battle of Stalingrad and the battle of Budapest. ^ a b c d e f g h i j "The Volunteers of the Russian Expeditionary Corps in the Moroccan Division during the Second Battle of Marne". Archived from the original on January 19, 2008. Retrieved 2014-05-01. CS1 maint: BOT: original-url status unknown (link), by Henri Maurel. Retrieved 14 March 2009. ^ CRW Flags. History of the Flag of Estonia. Retrieved 4 July 2007. ^ 1er régiment spécial aux ordres du colonel Mikhaïl Netchvolodov, 2e régiment - colonel Dyakonov. ^ 5e régiment - colonel Narbout, 6e régiment - colonel Simonov. ^ Jamie H. Cockfield - With snow on their boots: the tragic Odyssey of the Russian expeditionary force in France in World War I - St Martin Press - New York, 1999 - pages 96 and fol. ^ a b Clément, Robert. "La Brigade Russe a Courcy". Retrieved 31 August 2014. ^ Reed, John. Ten Days That Shook The World. Penguin Classics. ^ "WW1 rebellion of Russian troops on the Western Front at Courtine, France". Archived from the original on July 29, 2009. Retrieved 2014-05-01. CS1 maint: BOT: original-url status unknown (link). Retrieved on 4 July 2007. ^ "Statuts de l'Association " La Courtine 1917 "". La Courtine. Association pour la mémoire de la mutinerie des soldats russes à La Courtine en 1917. Retrieved 31 August 2014. Remi Adam, Histoire des soldats russes en France 1915-1920 : Les damnés de la guerre, L'Harmattan, 1996. Gilbert Cahen : « Le temps retrouvé du soldat russe Anissim Ilitch Otmakhov - France 1916-1920 », ISBN 978-2-7466-5606-2, 288 pages, 30 photos, 2 cartes. Auto-édition Gilbert Cahen Versailles, mars 2013. Cockfield, Jamie H. With Snow on Their Boots: The Tragic Odyssey of the Russian Expeditionary Force in France During World War I. ISBN 0-312-17356-3. Poitevin, Pierre, "La Mutinerie de la Courtine. Les régiments russes revoltés en 1917 au centre de la France", Payot Ed., Paris, 1938. The American Expeditionary Forces was a formation of the United States Army on the Western Front of World War I. The AEF was established on July 5, 1917, in France under the command of Gen. John J. Pershing. It fought alongside French Army, British Army, Canadian Army, and Australian Army units against the German Empire. A minority of the AEF troops also fought alongside Italian Army units in that same year against the Austro-Hungarian Army. The AEF helped the French Army on the Western Front during the Aisne Offensive in the summer of 1918, and fought its major actions in the Battle of Saint-Mihiel and the Meuse-Argonne Offensive in the latter part of 1918. The Polish Legions was a name of the Polish military force established in August 1914 in Galicia soon after World War I erupted between the opposing alliances of the Triple Entente on one side ; and the Central Powers on the other side, including the German Empire and Austria-Hungary. The Legions became "a founding myth for the creation of modern Poland" in spite of their considerably short existence; they were replaced by the Polish Auxiliary Corps formation on 20 September 1916, merged with Polish II Corps in Russia on 19 February 1918 for the Battle of Rarańcza against Austria-Hungary, and disbanded following the military defeat at the Battle of Kaniów in May 1918, against imperial Germany. General Haller escaped to France to form the Polish army in the West against the anti-Polish German-Bolshevik treaty. The Honorary Russian Legion was a battalion size group of Russians from the Russian Expeditionary Force in France who continued fighting for the Allied cause in the First World War after the Bolshevik Revolution. Courcy is a commune in the Marne department in north-eastern France. 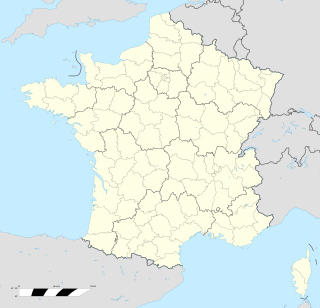 Saint-Thierry is a commune in the Marne department in north-eastern France. The 1st Marine Infantry Regiment is a French regiment heir of the colonial infantry. The regiment is one of the « quatre vieux » regiments of the Troupes de Marine, with the 2nd Marine Infantry Regiment 2e RIMa, the 3rd Marine Infantry Regiment 3e RIMa, as well the 4th Marine Infantry Regiment 4e RIMa. Along with the 1st Marine Artillery Regiment 1e RAMa and the 2nd Marine Artillery Regiment 2e RAMa, the 1st Marine formed the Blue Division. The 1e RIMa is a light armoured unit, since 1986, alike with the régiment d'infanterie-chars de marine RICM. Georges de Bazelaire was a Major General in the French Army. During World War I, Bazelaire commanded the 135th Infantry Regiment, the 27th and 38th Infantry Divisions and the 7th Army Corps. 1st SA Infantry Regiment was an infantry regiment of the South African Army, during World War One.